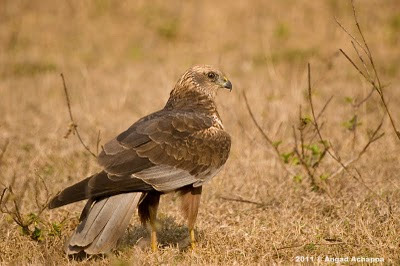 Was going through my archives when i found some decent images of the Female Eurasian Marsh Harrier. The marsh harriers prefer wetlands or marshy areas, especially those rich in common reed. Migratory as they are, the come down to India during winters around September-October and remain until March after which they head back to their homeland. 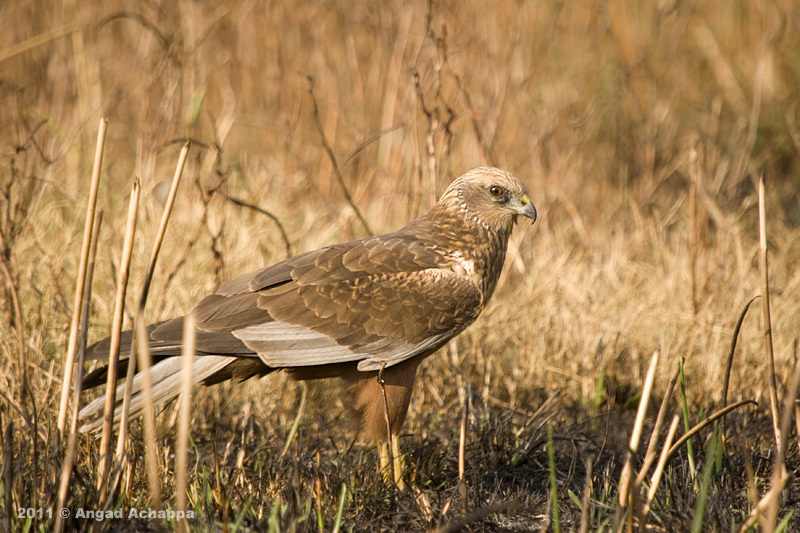 Marsh harriers feed on small birds, amphibians, fish and small mammals. On some occasions they have been known to hunt larger birds such as flamingos. I quite liked this setting where the brown colored bird was sitting amongs the dried up reeds and some scorched patches of grass. Just beautiful birds and photos. I like the light in them also very much. Stunning images! The Marsh Harrier is quite lovely against the earthy background colors. Great detail. A pleasure to visit your wonderful blog! I like birds of prey. We do not have this bird in my part of the country but we do have hawks and harriers and eagles. I like your crisp photos of this bird. Nice shots. A real beauty of a bird. Oh my! Were you laying on the ground? These are perfect sharp and beautiful images of this female. Well done Angad. I'm so glad I found your blog again! I like the look of the bird in this natural setting as well, just a lovely set of images! Thanks for visiting my blog and your comment. Your blog is very good source of information about various birds. Really impressive. Keep visiting my blog and share your valuable comments. I love its elegant & majestic look...even on ground....thinking how beautiful it is flying!!!! You are righ: its position is gorgeous....all brownbeige colours match perfectly the lighter ones of nature!!! !